Wow! Thank you so much for your supportive comments from my last post. You guys are like having my own little cheering section, and don’t we all need one of those every once in a while? My posts are a little out of order because my camera died on me today and I didn’t have my battery charger with me. But I have to share with you what I made for dinner last night, so bear with me as I backtrack a little. 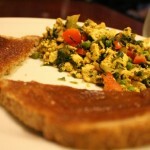 Remember the yellow curry tofu scramble I had a couple of weekends ago at brunch? Well I didn’t forget it. I knew I wanted to remake it at home, especially after Katie told me she had made it. 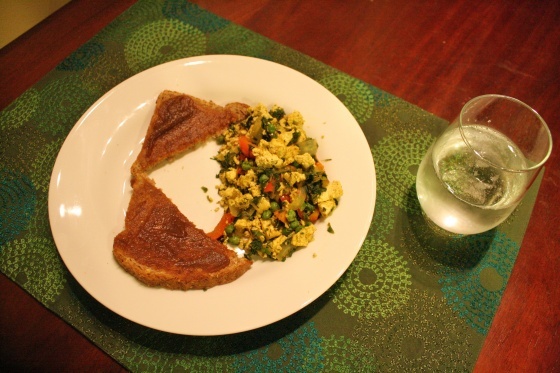 It looked relatively simple and until then, I had never made a tofu scramble before. It was time to give it a try. 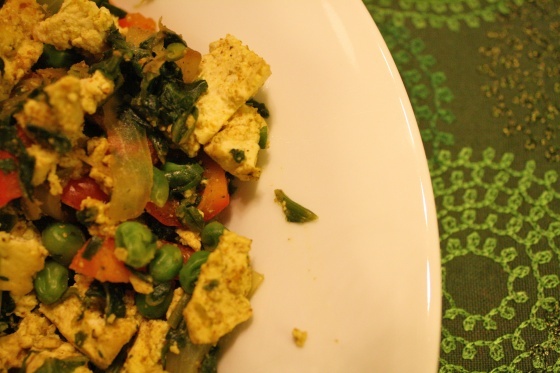 Remove tofu from package and press to remove water by wrapping in paper towels or a kitchen towel and placing something heavy on it for 15-20 minutes. Meanwhile sauté the onion and bell pepper on medium high heat until onions start to brown. Add peas and spinach and cook until they are completely unfrozen, stirring often. Add tofu and use spatula to break tofu apart until it is crumbled in bit size pieces. Add curry and garlic powder. Stir to spread spices throughout the mixture. Add salt and pepper to taste. 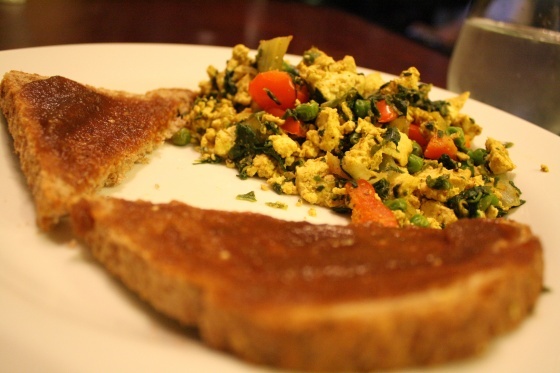 I ate my serving with a piece of toast slathered with apple butter, just like my brunch at Zada Jane’s. I loved it and Brad did too! This was such a quick and easy meal after I did 30 minutes on the elliptical for cross training day and also did 100 bicycles and 20 sad little push ups. They were sad because only five of them were boy-style. If I skip a week of push ups, I lose my strength so fast it’s scary. 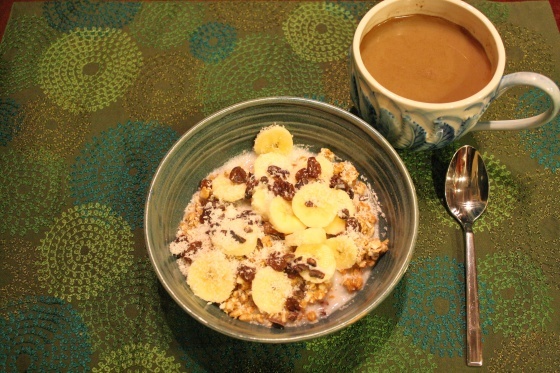 This morning, I kept it simple with Kashi Go Lean Crunch cereal. Since I’ve been craving it, I might as well eat it for breakfast, right? Over the next few days, blogging will most likely be sporadic. I’m heading to a conference tomorrow in Durham, which means a lot of eating with other people. I’m not all that into whipping out a camera with a bunch of people I don’t know and coworkers. So I’ll be popping in occasionally to say hello and show you anything I am able to snap with my camera. Brad is going up to with me, because he has a meeting close by in Raleigh, then leaving Thursday morning to make a trip down to Florida for work. 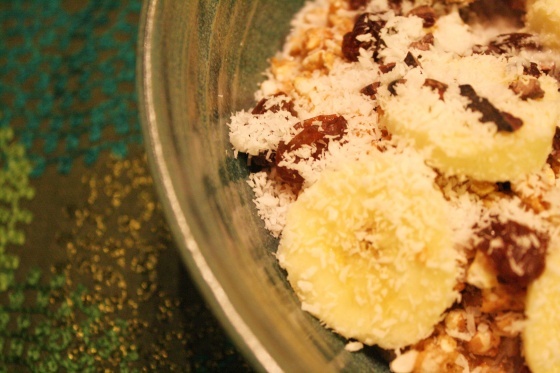 Don’t forget to enter my coconut peanut butter giveaway! I haven’t forgotten about posting a recipe to coincide with the giveaway, I’ve just been super duper busy and short on time. There is a recipe brewing in my head that I can’t wait to try this weekend. Brad and I have a Super Bowl Party to attend where there will be a lot of potential taste testers to try out my concoction.